A comet visited by a NASA spacecraft this month is spewing jets of vaporized dry ice into space, scientists have found. 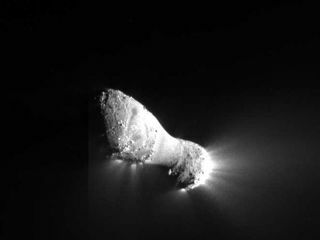 "Previously it was thought that water vapor from water ice was the propulsive force behind jets of material coming off of the body, or nucleus, of the comet," said Jessica Sunshine, a professor of astronomy at the University of Maryland who is deputy principal investigator for the mission in which the Deep Impact probe visited Comet Hartley 2. Deep Impact flew within 435 miles (700 kilometers) of Hartley 2 on Nov. 4 and beamed back to Earth a series of close-up photos of the comet, which has the shape of a chicken drumstick. The images show spectacular jets of gas and particles bursting from many distinct spots on the surface. Deep Impact's flyby photos and data showed that buried – but frozen – carbon dioxide on Hartley 2 turns directly into gas when heated by sunlight, researchers said. The process is called sublimation. "This is a finding that only could have been made by traveling to a comet, because ground-based telescopes can't detect [carbon dioxide] and current space telescopes aren't tuned to look for this gas," Sunshine said. Scientists used three instruments on Deep Impact – two telescopes with digital color cameras, and an infrared spectrometer – to study the composition of the comet's surface material, its jets and its coma, which is a cloud of particles around its core. So far the team has found that water and carbon dioxide dominate the infrared spectrum of Comet Hartley 2's environment, and that organic material, including methanol, is present at lower levels. The scientists were surprised to observe so much carbon dioxide escaping from the comet. "The distribution of carbon dioxide and dust around the nucleus is much different than the water distribution, and that tells us that the carbon dioxide, rather than water, takes dust grains with it into the coma as it leaves the nucleus," said assistant research scientist Lori Feaga. "The dry ice that is producing the [carbon dioxide] jets on this comet has probably been frozen inside it since the formation of the solar system." Compounds such as carbon dioxide, and not water, may be a common characteristic of other comets, too. When Deep Impact flew by its first comet, Comet Tempel 1, in 2005, scientists were unable to conclusively trace the carbon dioxide to the comet's surface because the hemisphere that appeared to be enhanced by the dry ice was in darkness during that encounter. NASA and the science team at University of Maryland recycled Deep Impact to a second comet – ultimately Hartley 2 – to learn more about the diversity of comets. This eventually became the EPOXI mission. The images of Hartley 2 reveal it has an elongated nucleus 1.24 miles (2 kilometers) long and 0.25 miles (0.4 km) wide. The nucleus of Hartley 2 is only the fifth cometary nucleus ever seen, and it exhibits similarities and differences to the bodies or nuclei of other comets. The team expects to announce more science findings in the coming weeks, as new data from the closest approach continue to be received at a rate of some 2,000 images a day. NASA plans to hold a press conference to discuss the latest discoveries from the Comet Hartley 2 flyby on Thursday (Nov. 18).